Kim shares a story about a time that she describes as the worst moment of her career. She learns a hard lesson after being Ruinously Empathetic with one of her employees for a period of several months. Although she Cares Personally and tries to be “nice,” her lack of Direct Challenges causes issues for her, for the employee, and for her whole team. 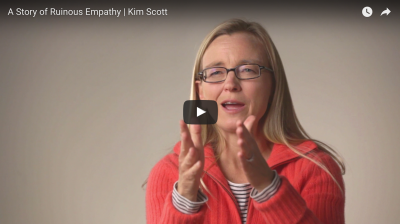 Listen to episode 4 of the Radical Candor podcast to hear Kim and Russ discuss this story and provide tips for avoiding Ruinous Empathy. Have you found yourself in a position like this one? We’d love to hear your story! Reach out in the comments below or on Facebook. One of the tips we shared in our post about how to get more feedback is to reward feedback to get more of it. If you want to get others to open up and tell you what they think, you have to show them that you appreciate it. It’s a risk for them to tell you what they think, and if the risk isn’t worth it — if they are punished for their real-talk or see that it is ignored — they won’t continue taking it. So if you want to encourage people to continuing giving you important feedback, reward the candor! In the end, you get the behaviors you reward. If you reward candor, if you reward straight-forward talk, you will get it. 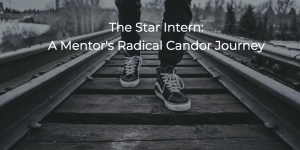 We learned about a great example of rewarding the candor when we were at Instacart earlier this year. Max Mullen, co-founder of Instacart, uses Instacart carrot pins to thank and recognize someone when they offer him Radical Candor. He gives them a carrot pin to wear and gives them an extra carrot pin to pass on. When someone offers them Radical Candor, they can reward that candor with a carrot pin as well. Now, as you walk around the 350-person Instacart office, you can see people wearing their carrot pins and recognize that they’ve been successful in Challenging Directly and showing they Care Personally. 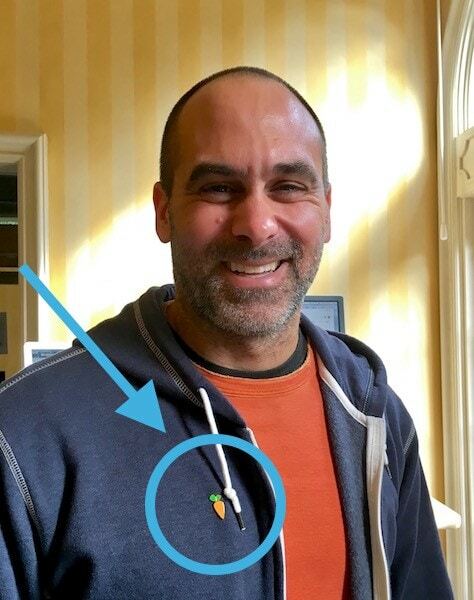 During the visit to Instacart, Russ was lucky enough to earn one of the pins because of his Radical Candor :) He also of course received one to pass along to the next person who gave him Radically Candid feedback. We’ve written a lot recently about getting feedback from others and also giving feedback to them. You have to lead by example, so it makes sense to start by soliciting feedback and then to focus on giving it. 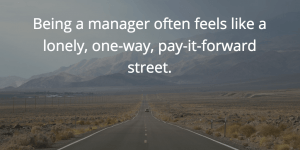 But real managerial leverage comes when you learn to encourage feedback between others. As just one person, if all the praise and criticism goes through you, you become a bottleneck. 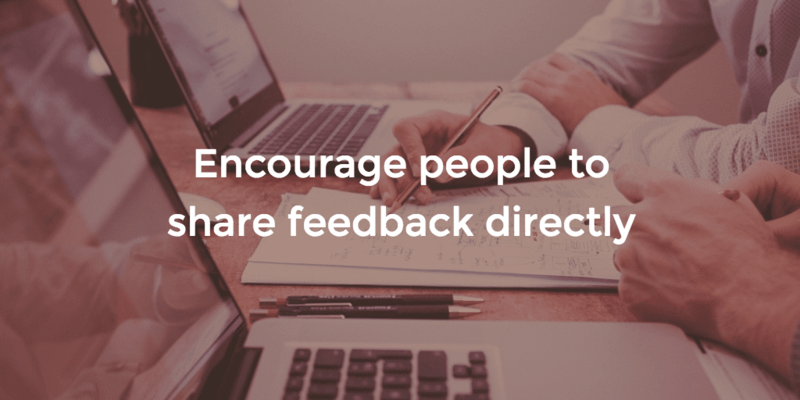 In order to foster a feedback culture and ensure that it scales across the team/company, it’s important to make sure that peers give and receive feedback to one another. When someone tells you about something great a colleague did, urge them to also share that feedback directly with the colleague who did the great work! This will develop stronger relationships between peers, allow for more praise to be shared (again, you don’t want to be a feedback bottleneck), and provide more perspectives on what’s going well and why. When there are issues, insist that people communicate them directly. Remind them that Radically Candid criticism is kind and clear. It’s kinder for them to tell their colleague about the issue that needs to be fixed than to report that issue to the boss. 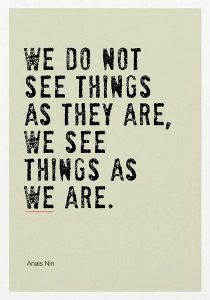 They’ll also be able to be more clear than you could, because they have the details and context of the issue. The flipside of this is that if people come to you criticizing a colleague, don’t give them a chance to bring you into a triangle of complaining, name-calling, or back-stabbing. Talking with the person on each side of an issue individually may seem like being a good listener, but it usually means you’ll get one-sided, biased and incomplete stories plus hurt feelings. You are not being empathetic, you’re just stirring the pot! You are a boss, not a diplomat. Shuttle diplomacy won’t work for you. When you triangulate, you end up creating politics. Each side becomes suspicious that you’re talking behind their back (which you are). The two begin to distrust each other and a toxic relationship develops. You can avoid this by simply asking them to talk to each other directly. Part of your job as the boss is to offer fair, efficient conflict resolution. Sometimes people on your team will run into a conflict they can’t resolve. They may be able to challenge directly, but that doesn’t mean they can resolve the issue without your involvement. In those cases, provide a way for them to escalate the issue to you together. Offer to have a three-way conversation to discuss the issue. Each party will tell their side of the story with the other present, avoiding the one-sidedness and exaggeration that may come up in triangulation. You will act as moderator and facilitator. It’s best to do this in person, but a video or phone call will also work. Avoid conducting these discussions over email — an asynchronous conversation makes it difficult for you to spot and react well to emotions that will inevitably arise. Your role in this meeting is to help the two parties come up with a solution they both can understand and live with. Don’t punish them for failing to work it out without your involvement. Your job is to be supportive, not punitive when they can’t work it out. Otherwise, you’ll create a culture with no good path to conflict resolution, and people will therefore avoid conflict at all costs. People will be afraid to criticize each other in case it leads to conflict. That’s the opposite of encouraging a culture of Radical Candor! 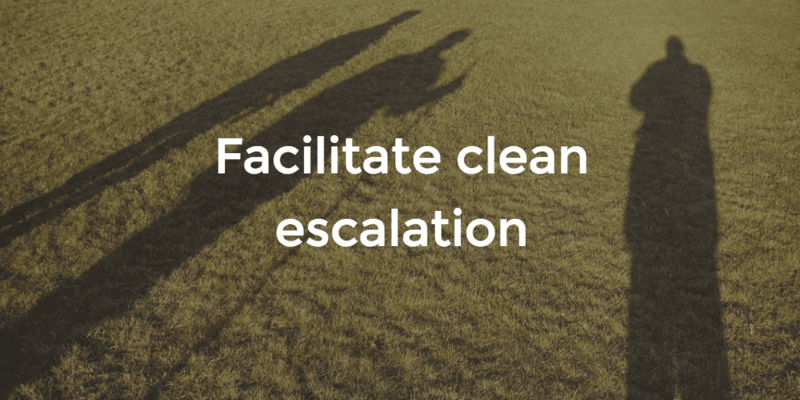 With a supportive clean escalation meeting, however, you’ll help build trust between the two parties and show them how sharing criticism leads to a better outcome for everyone. Many companies have systems in place for peers to recognize and praise each other’s work. Google, for example, has a peer bonus system that allows employees to give monetary bonuses to their peers for work well done. Monetary systems like this can be expensive, and not every company can afford to do this. But there are many other recognition systems that require less investment. At Square, Gokul Rajaram has his team submit kudos about great things they’ve seen each other do each week. They are submitted to a shared document so others can comment. Gokul reads them all each week and selects a couple of kudos to highlight. At Qualtrics, Jared Smith built a system on the intranet that allowed employees to give each other virtual appreciation badges for great work. Badges accumulated on a person’s profile page on the company intranet, and helped to create a culture of praise. If your company uses Slack, you can create a #kudos channel. 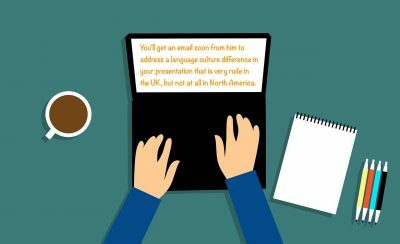 If you use Google Docs, Office 365, or other software with collaborative editing, you can easily create a shared document for shout-outs. Part of the reason these systems work so well is that they help people overcome a reticence to praise. People worry about their praise feeling patronizing. They wonder if they are really qualified to praise someone else’s work. Having a standardized recognition system emphasizes the worth of praise, both to individuals and to the company. The system helps people be more confident that their praise will be appreciated, and therefore makes them more likely to offer it. Even if your company doesn’t have a system like this, you can come up with a low-tech, low-cost version for your own team to encourage more praise between team members. 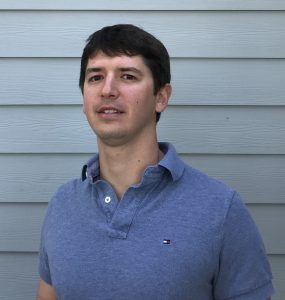 Dan Woods, who was CTO at a startup where I worked in the 1990’s, developed the cheapest, most effective system for encouraging praise and criticism on a team that I’ve ever seen. He used a stuffed whale (sometimes a dog) to encourage praise and a stuffed monkey to encourage public self-criticism. I admired his system so much I stole it, and it was probably my single most effective management tool at both Juice and Google. 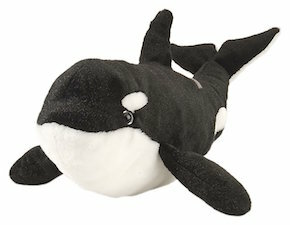 Here’s how it worked: At every all-hands meeting, I invited people to nominate each other to win the killer whale for a week. The idea was to get people from the team to stand up and talk about some extraordinary work they’d seen somebody else do. The winner of the whale the previous week decided who deserved the whale this week. Next, people nominated themselves for the stuffed monkey, who we named “Whoops.” If anyone screwed up that week, s/he could stand up, tell the story, get automatic forgiveness, and help prevent somebody else from making the same mistake. When we first started doing this at both Juice and Google, there were crickets. Not knowing what else to do, I put $20 on Whoops’s head. The stories started pouring out. Plausible deniability goes a long way — now people could pretend they weren’t copping to my corny stuffed animal, they really wanted that $20! The stories that the Killer Whale and Whoops elicited were my favorite part of most all-hands meetings. We all learned a lot in that 15 minutes, and everyone received a strong message that feedback was encouraged. One of the most helpful suggestions I ever got as a manager came from Roxana Wales, who worked at NASA and then in Learning and Development at Google. She told me that one of the most important things any “manager of managers” could do to foster a culture of feedback was to have so-called “skip level meetings.” This sounds unbearably big company hierarchical, but bear with me. The best way to put hierarchy in its place is to admit when it exists and think of ways to make sure everyone feels they are on an equal footing at a human level despite the structure. You have to find ways to help people speak truth to power. Skip level meetings are conversations you have with teams without their manager in the room to get feedback on how that manager is doing. I know, I know, this is the opposite of clean escalation. It also has the potential to turn into a gripe session or to disempower the manager. So skip level meetings must be conducted extremely carefully. Given these risks, why have these conversations at all? The reason is that when there is a power imbalance, requiring clean escalation is sometimes not realistic. What percentage of people actually tell their boss what they really think? Certainly not the majority. Plus, managers, especially new managers, will consciously or unconsciously seek to repress criticism rather than to encourage it. Skip level meetings are a great way to encourage the flow of feedback despite these potential barriers. 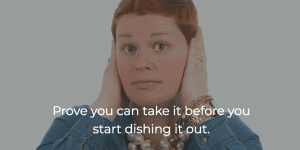 We’ll share detailed tips for effective skip level meetings in a future post. Try these tips for encouraging feedback and let us know what you think! Did they help? Have you observed any other methods for encouraging feedback across organizations? When you’re the boss, it’s really hard to get people to tell you what they really think — to be Radically Candid with you. Showing that you want feedback and genuinely appreciate it when it’s given is key. The worst thing you can do is to criticize the criticism you get. In fact, it can actually be helpful to encourage people to be Obnoxiously Aggressive with you. Here’s a funny example of Jim Koch, co-founder of the Boston Beer Company (makers of Sam Adams), doing just that. Usually when we talk about embracing the discomfort, we are talking about enduring that awkward silence when you ask somebody who works for you what they think of your performance. But sometimes you don’t get awkward silence, you get an f-bomb. Now it’s your discomfort, not the other person’s, that you have to embrace. Admittedly, the wording used — personalized and arguably unkind — is quintessential Obnoxious Aggression, and we don’t really advise encouraging that between employees. But, as the boss, you often have to be the emotional punching bag, able to absorb the f-bombs that get hurled at you. Have a go-to question — To get someone to give you feedback, it can be really helpful to have a go-to question that gets the conversation started. We use examples like “What could I do differently, or more of, to make it easier for us to work together?” or “Tell me how I’m making your job harder.” Getting someone to tell you “F you” is another take on this underlying goal. You want to get people to tell you what they really think. Build a culture of feedback — By encouraging people to use this rule with each other, and especially with him, Jim is creating a built-in mechanism in the company culture to enable people to give and get feedback. He sets an example by listening respectfully to feedback and sending a message that getting things out in the open is the only way to resolve them. 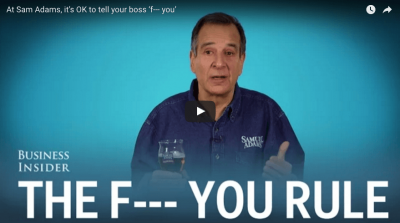 Challenge Directly AND Care Personally — Jim lays basic ground rules for the “F You” rule that help it become more Radically Candid. It’s a pretty direct challenge on its own, but he clarifies that it also has to be followed by specifics, so that it isn’t just an unclear, hurtful phrase. He also says that it has to be given humbly. The person delivering it has to be open to hearing the other person’s side, showing that they care about both perspectives. We say Kudos to Jim Koch for making people feel free to tell him what they really think! But what do you say? How does this approach strike you? Does it put you off? Does it seem like Obnoxious Aggression? As a CEO who hasn’t been practicing Radical Candor, is it advisable to transition into the practice immediately or slowly introduce it into the company’s culture? My advice is to start right away but understand that it will take continuous practice to make a lasting change. Here are some steps you can take to ensure a successful transition. 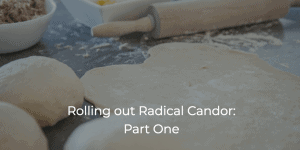 Start by explaining the idea of Radical Candor and the 2×2 to your company in your own words. It is important to establish the shared vocabulary so that everyone can understand the goal and feel comfortable changing their behavior. Tell your company that you think you have not been Radically Candid enough, and that you’re going to try to make a big change. By communicating that you want to improve, you’ll show your team that you’re serious about the cultural shift. Prove that you mean it by asking for their help. Ask them to rate your feedback — to tell you when they feel you are veering into one of the other three quadrants. Remind them, these are not labels for people, they are labels for behavior. 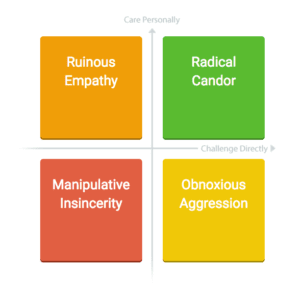 By building a collaborative process, you’ll improve your own impromptu feedback quicker, and you’ll help your team see first-hand the impact of Radical Candor. When they see the improvements, they’ll also be encouraged to make the change themselves. You won’t become Radically Candid overnight, and it’s almost impossible to be Radically Candid 100% of the time. My experience with changing behavior is that I generally have to overshoot. In other words, if I’m convinced that my behavior is consistently Ruinously Empathetic, I’m probably going to have to feel like I’m being a real jerk before I get to Radical Candor. That is really uncomfortable. But if you’ve communicated to your team why you’re changing and asked them to rate your feedback, they’ll understand and help you improve. The important thing is that you explain to your organization that you are going to start saying what you think a lot more clearly, and that you’re not doing it to be a jerk, or to hurt anyone’s feelings, you are doing it because you care about each person you work with personally, and you want to help them do the best work of their careers. And then walk the walk on that. In short, go all-in yourself and continually involve your team. And remember that Radical Candor is HIP (Humble, Helpful, Immediate, In person, Private criticism/Public praise, not Personalized). Please let me know what you think of this advice in the comments below. I’m sure I got some stuff wrong and would love any guidance readers have to offer! Do you have a question or tricky management situation? Ask us for advice!